This hummus is crazy delicious. It’s savory, creamy, smoky, subtly spiced, slightly sweet from the squash and lemony. This is the perfect dip to have on hand for a week of healthy snacking. It would also be great for entertaining or taking along to parties. It gets its flavor from both roasted and fresh garlic, lemon juice, parsley, smoky cumin, paprika, and a pinch of cinnamon. 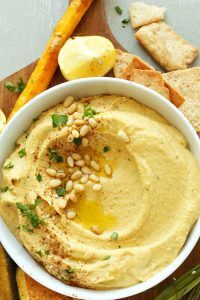 This hummus is bursting with autumn flavors and is absolutely perfect with some pita chips and/or fresh vegetables. Add cubed butternut squash and 4 unpeeled garlic cloves to a baking sheet and drizzle with 1 Tbsp olive oil and a pinch each salt and pepper. Toss to combine. Bake for 15-20 minutes, or until all squash is fork tender and the garlic is golden brown. Let cool 5 minutes. Peel roasted garlic and add to food processor or blender, along with squash, 4 cloves fresh minced garlic, lemon juice, chickpeas, tahini, olive oil, salt, pepper, parsley, cinnamon, cumin, and smoked paprika (optional). Puree until creamy and smooth, scraping down sides as needed and adding more olive oil or a touch of water if it’s too thick. Taste and adjust seasonings, garnish with a sprinkle of paprika, drizzle of olive oil and a few pine nuts. Then serve immediately with pita chips and vegetables of choice. Alternatively, refrigerate until fully chilled – about 3-4 hours – for a thicker, creamier dip. Store leftovers, covered, in the refrigerator up to 4-5 days, though best when fresh.